The West's Premier Model Railroad Show! HO, N, Z, S, O, G, Lionel & Narrow Gauge Will be Represented! 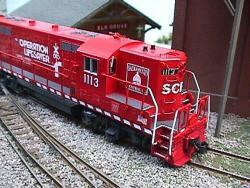 Kids can operate a model train and become a Junior Engineer! Adults: $10, Children under 12 Free! MODEL RAILROADING IS GREAT FAMILY FUN! Additional Show Information / Questions?